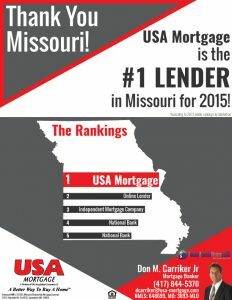 USA Mortgage was just ranked the #1 lender in the state of Missouri for all of 2015! We finished last year with 5.25% of the market share in the entire state of Missouri… and we are not even in the Kansas City area. That means nearly 1 in every 19 home loans done in our great state were done by USA Mortgage! That’s a big WOW!!! You know who was a distant 2nd? That “Rocket Mortgage” company Quicken Loans, with only 3.72% of the market share. “And what about the purchase loans (not refinances),” you ask??? USA Mortgage was ranked #1 with an astounding 7.09% market share! 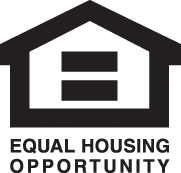 That’s 1 of every 14 home sales in the STATE we financed! The #2 lender was a VERY distant 4.33% of the market share. 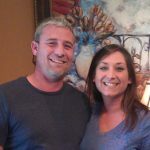 We love what we do and it shows in our company’s tremendous growth! 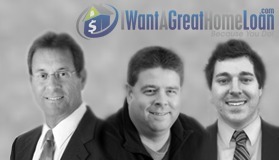 If you need a home loan for the purchase of a new home or to refinance your current home, we invite you to work with our great company and our proven track record. You can start working with the leader by filling out our Quick Inquiry today! Thank you for being a huge part of our success!